Getting rich quick - and having much more money than you ever need - will look as pointless as taking bodybuilding too seriously, says Clive James. This is my last broadcast until my next spell and I'm in a summing up mood. I have no New Year resolutions apart from the usual one about tidying my office in case the body of my missing cleaner is lying mummified under that pile of magazines. But I do feel like making a New Year prediction. I want to put down a marker that proves I have a grip on world events. The best way to prove this is to make a prediction that everybody knows has already come true, but that few people are yet ready to admit. I hereby predict that from now on, starting today, nobody will look good who gets rich quick. I can predict more than that, in fact. Even getting rich slowly is going to look silly, if getting rich is the only aim in mind. Getting rich for its own sake will look as stupid as bodybuilding does at that point when the neck gets thicker than the head, and the thighs and biceps look like four plastic kit-bags full of tofu. And on the men it looks even worse. Just before Christmas, as if the collapse of some of the world's relatively honest financial institutions had not already been unsettling enough, hedge fund boss Bernard Madoff was accused of swindling the world's smartest investors out of a grand total of $50bn. How, it was asked, could the world's smartest investors have fallen for this character? The answer, surely, is that they were all like him. They thought they had found a way of making money out of nothing. Unfortunately for them, the ineffable Mr Madoff appeared to have found a way of making money out of nothing. All he allegedly had to do was tell them he had invented something called "a split conversion strategy" and they handed over their money. But most of them had got their money the same way, by promising vast returns on money from other people who were trying to make money out of nothing. Many profound articles were written by the financial experts to explain how the whole mad Madoff cycle had been generated, but the question that was never asked is the one that bears most closely on my theme. What was he going to do with $50bn? 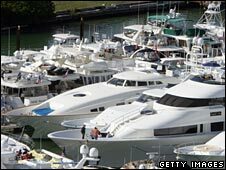 Back at the start of this series, I raised the issue of what the multibillionaires who owned yachts were hoping to achieve (see The name's Bond in the Clive James archive, top right). At best, their ridiculous unarmed battleships, permanently parked in the teeming marina of the sort of city where the world's well-dressed dimwits gather to gamble at the casino, were described as floating palaces. What kind of numbskull wants a palace that floats, when he could just have a palace, out of whose front door he could stride with some confidence that he would not plunge face-first into the harbour? I was really asking a question about what you can do with too much money, and the answer was obvious: never enough. How much money is too much? It's too much when you've already got all you could possibly need, and there's nothing to do with it any more except count it. There have been some encouraging signs that this elementary realisation has at last begun to dawn. Bill Gates saw the light early. Bill Gates, who invented the software which has just given me a picture of Donatella Versace after I pressed the wrong button - wait a second, I certainly don't want to see any more of that - Bill Gates got to the point where he started to look for useful ways of giving some of his money away. It was good news for Africa, which needs the kind of well-researched, well-targeted and well-protected money that will go into things like roads and seeds, and not the kind of money that will go into the bank accounts of black leaders as greedily aimless as the kind of white dolts who buy yachts as big as the USS Nimitz. 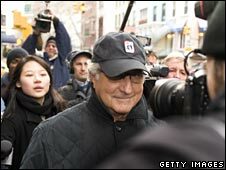 If there is a tragedy anywhere in the uproarious comedy of the Madoff madness, it lies in the fact that some people who were trying to do what Gates did - assemble a fund that would help the world's poor - handed the fund to someone who promised to make the fund bigger, who then applied the magic split-conversion double downdraft fiscal disappearance strategy. So good money vanished that could have helped to build a road that would have carried the equipment to the right spot to build a well that would have watered a field that might have grown the grain that might feed the sort of people who are currently eating their own carpets in Zimbabwe. 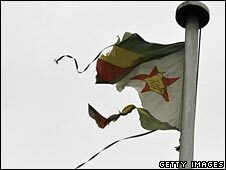 The first thing Zimbabwe will need, of course, after Mr Mugabe finally gets sent off into exile to live in a suite at the top of some nut-job Gulf hotel with an uninterrupted view of 10,000 square miles of desert, is honest government, which is based not only on real elections, but on double-entry bookkeeping. Worldwide, the mundane but crucial concept of balancing the account books with earned income against genuine expenditure is more likely to become implanted now that all the split-conversion doubletalk is suddenly no longer fashionable. The upmarket weekend papers have been full of canvassed opinions about what good might come out of the recession but the right answer is already in. The recession isn't just a wake-up call telling us to get real. We've got real. The good housekeeping seal of approval has returned to power. It's the end of an era of silly money. 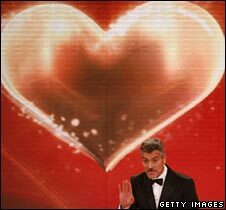 The actor George Clooney spends a lot of time on good causes. He's famous for it. You could say that all the publicity he gets for doing it helps to make him even more famous than he is already and that therefore charity is to his advantage, but it would be a mean view. He couldn't make all those interesting little movies we admire him for so much if he didn't make all those uninteresting big movies for which we admire him a little less, so we should forgive him his huge salary. But already, because of the new mood, it's getting harder to forgive him for advertising coffee. If the coffee commercials make him the extra money that he gives away, that must leave the huge salary intact. Well, yes, he might say, but he has a lot of people on his payroll. Ladies, I like him too, so I want to believe that it all checks out. But one thing doesn't. He isn't credible when he tries to sell me coffee. I just don't believe that a brand of coffee tastes better because George Clooney drinks it. He looks silly. I advertised something myself once. I made a set of commercials for an Australian telephone company. The commercials were beautifully shot but the campaign was a total failure, because the competing telephone company was selling a better product cheaper, so nobody believed what I was saying. I could still use that kind of money even now, but if I tried to get it that way I would expect to be told that I looked silly. Matthew McConaughey is doing commercials for a certain fragrance. I'm sure the extra money he is making is going to a good cause, but there are two questions that I ask automatically whenever I see those commercials. The first question is: Who wants to smell like Matthew McConaughey? And the second question is, doesn't he looks silly? Life is harder and shorter for female film stars than it is for male film stars and I'm sure there are good reasons for Charlize Theron to be the face of a certain fragrance. She might even sincerely believe in the stuff if it gives her the confidence to wear nothing else except a pair of high heels as she sways away down the corridor into the bedroom, the bare behind of a certain fragrance trailing a subtle cloud of bliss. But I can only ask: couldn't she have just sold her Oscar? And doesn't she look silly? For Nicole Kidman, also, life might be tougher than we think. A beautiful woman reduced to starring in a film like Australia when she could have negotiated a year's work painting the Sydney Harbour Bridge with a nailbrush and made a greater dramatic impact might well need extra income, but her commercials for another certain fragrance ask us to believe that it must smell good because she's wearing it. If I could be assured that the certain fragrance doesn't make Nicole Kidman smell different, but instead smells exactly like Nicole Kidman, I would buy a bottle and drink it. But otherwise I'm convinced of nothing except that she looks exactly as if she's hustling for a buck she doesn't need. Even if she does, is this the way to get it? Doesn't she look silly? In the old days, the actors did commercials offshore. Harrison Ford advertised products in Japan on the understanding that the commercials would never be screened in the United States. He was following the example of Laurence Olivier, who advertised cameras in the US on the understanding that the commercials would never be screened in the UK. It was agreed, back in the day, that serious artists should not look like hucksters. Now it is assumed that serious artists look even more serious if they do look like hucksters. They look bigger, more corporate, more influential. Or they did until yesterday. But now it's today, and it suddenly looks like a fast buck. It looks off. Madoff off. And it looks silly. We've reached a turning point. A madness has gone out of fashion: the madness of behaving as if only too much can be enough. There will always be another madness, but not that one. From now on a man will have to be as dumb as an petrodollar potentate to think that anyone will respect him for sitting on a gold toilet in a private jumbo jet. Excess wealth is gone like the codpiece. The free market will continue but any respect for the idea of free money is all over. If you've got it, flaunt it by all means, but if you haven't earned it, forget about it. There isn't going to be a change of consciousness, there's already been one, which is why I can be so confident when I predict it. Until next time.